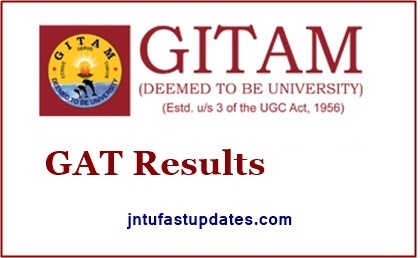 Gitam GAT Result 2019: Gandhi Institue of Technology And Management will conduct GAT Graduate Admission Test yearly for graduates and post graduates students. The result of GAT exam will be releases on April 26th. It conducts the exam in both online mode. To get better results, one should prepare according to the syllabus. Students who are successful in the exam their names will be displayed Gitam GAT Result 2019. Gandhi Institute of Technology And Management will conduct GAT Graduate Admission Test yearly for graduates and post graduates students. The result of GAT exam will be released in the 26th April 2019. It conducts the exam in online mode. To get better results, one should prepare according to the syllabus. Students who are successful in the exam their names will be displayed. In this article we will provide you the information about GITAM GAT exam result, Topper list, Score cord, Cut off marks, GAT 2019 for admission to various B.Tech programmes offered by the institute in its Bengaluru, Visakhapatnam and Hyderabad branches. To participate for admission to B.Tech programmes, candidates will have to fill the application form of GITAM GAT 2019 and appear in the entrance exam and can check the result from its official web site. Now we are providing you the crucial information to the students who want the admission in the GITAM GAT exam. The GITAM GAT merit list will be declared by the admission committee of GITAM University along with the result on the official website of the Gandhi Institute of Technology and Management. It includes the rank of candidates qualified marks in GITAM GAT 2019 exam. The candidates can check the procedure to download the result of GITAM GAT 2019 from here. In the login portal, candidates have to submit the GITAM GAT admit card number and date of birth and other details which is required. Clicking on ‘submit’ will display GITAM GAT results 2019 containing the candidate’s score and rank. It is recommended to download the result and retain 2-3 photocopies of result for future references. The candidates must remember the important things related to GITAM GAT result. In this Gitam GAT admission will be available directly through Central and state board exams also who secure highest marks. In Benguluru campus one fourth of the seats are reserved for the meritorious students. Though it has its own entrance exam and the graded students. GITAM Gat exam result contains the Score list of the students who have gained the merit marks. The candidates allotted the higher rank will be considered for the first seat as per the preferences, availability of seats etc.